If you have a special client or friend that you would like to reward. 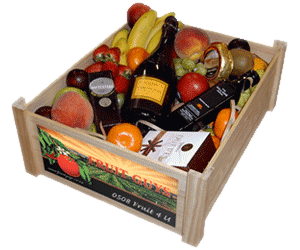 A ‘Fruit Guys’ case is a unique, healthy gift, that is always well received. Show them you care by providing a mouth wateringly delicious gift, that’s good for them too. We can deliver these special gift cases as you require. If you have special requirements, we can pack these attractive wooden cases to suit you. i.e. including wine, beer, handmade chocolates, gourmet cheeses etc etc…. Give us a call to discuss your gift giving needs.